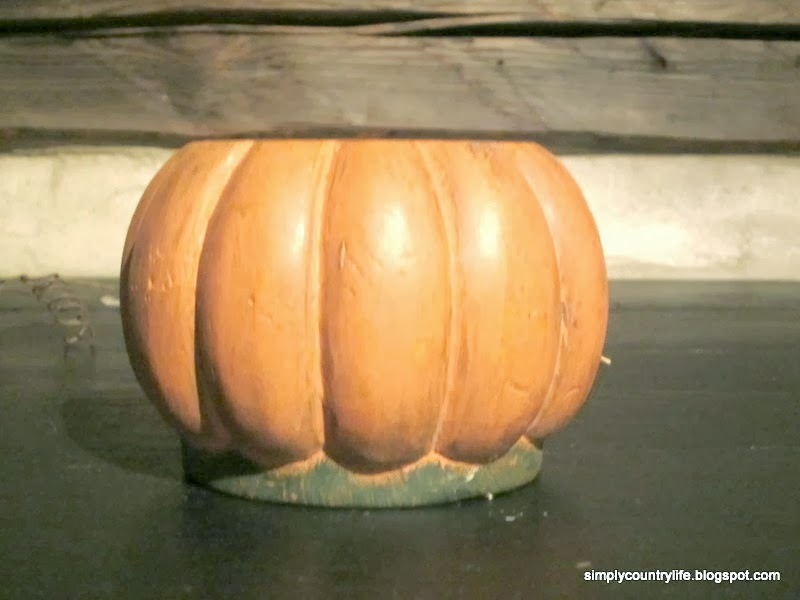 Can you recognize what this candle holder was in a previous life? Maybe if I show it to you upside down? Now just imagine it without paint and with a screw sticking out of the top about 2 inches. Have you figured it out yet? It was a foot that screws into the bottom of a chair. 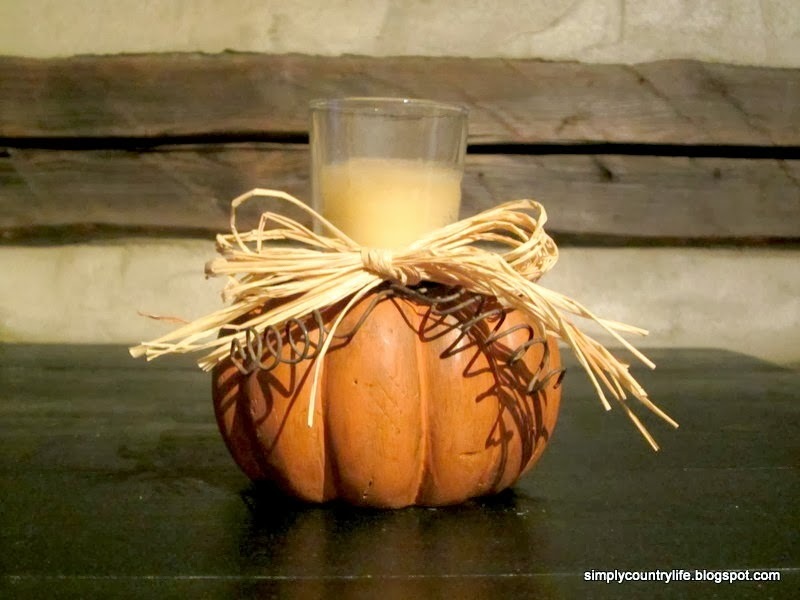 (I apologize that I do not have any before pictures) I upcycled all four of the feet the same way, creating two sets of pumpkin candle holders. Now onto how these feet became pumpkin candle holders. The screws were removed with pliers and then they were turned over so that the top was now the bottom. Using a drill bit that would fit the size of a votive candle holder, I drilled a hole about 1 inch deep in each of the four feet. They were natural raw wood and didn't really need any prepping for paint, so I started painting by rubbing acrylic craft paint on them with a t-shirt scrap rag. The bottom color is terra cotta and the top is forrest green. The candle holders were looking a little plain at this point. 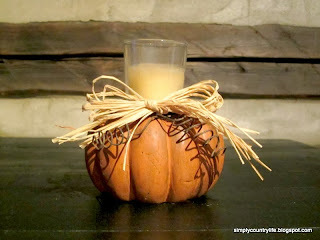 I wanted to add something to create the curly tendrils that natural pumpkins have. Rusty wire seemed to be a great rustic option and I already had some on hand! I cut four pieces of wire long enough to wrap around the "pumpkins" and have extra to create the curly part with. I did this by wrapping the ends of the wire around a pencil and stretching the curls out. They were still looking kindof plain, so my next rustic choice was raffia. I cut a few strands to fit around the top of each one and just tied them in a bow. Those additions were just enough to give the candle holders some charm. I kept a pair to use in our cabin and the other pair went into my Etsy shop. You'll probably never look at chair feet the same now. very very cute! and your story sounds like mine (15 years ago that is). My ex and I built a log home in a rural setting and went back to doing things in a more pioneerish way. It was fun at the time, a whole lot more work than I anticipated and I'm glad I experienced it. Enjoy your country life! 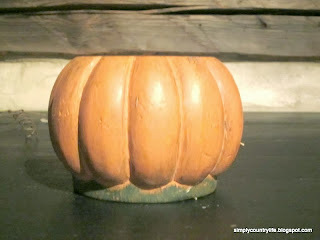 LOL, now if this just isn't the most clever little pumpkin trick out there in blogland! You're right, now I'll be prowling the junk store for these! Thank you for sharing at our TGIF Link Party at A Peek Into My Paradise. Your post will be featured at the TGIF Link Party this week! Great job Adina! You turned something cute into something amazingly adorable!! I am featuring it on my blog tomorrow. 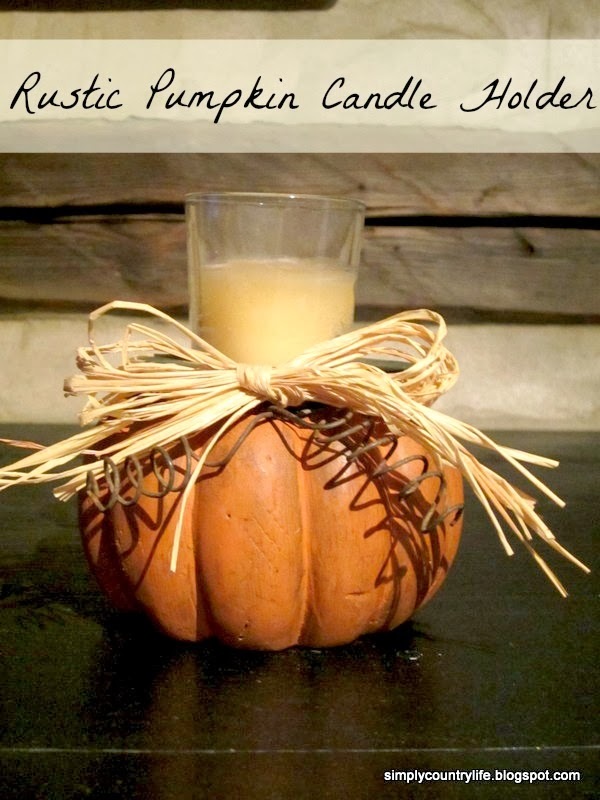 Thank you for linking up to Get Your DIY On. I hope you'll join us tomorrow with your burlap projects!! Mandy - Thank you, thank you, thank you!!!! G'day and very creative idea, true! Love seeing things that are different with a theme too!